With a $20 million gift from Robert and Myra Kraft, Partners HealthCare is launching a program to attract doctors and nurses to Massachusetts community health centers, the cornerstone of the push to reduce health costs and care for newly insured patients. The gift will create the Kraft Family National Center for Leadership and Training in Community Health to oversee the programs. A portion of the funding will support community-based programs at Dana-Farber Cancer Institute. Kraft would not say specifically how and why conversations between him and Partners began but he said he had been talking to Gottlieb about a major gift for nearly a year. 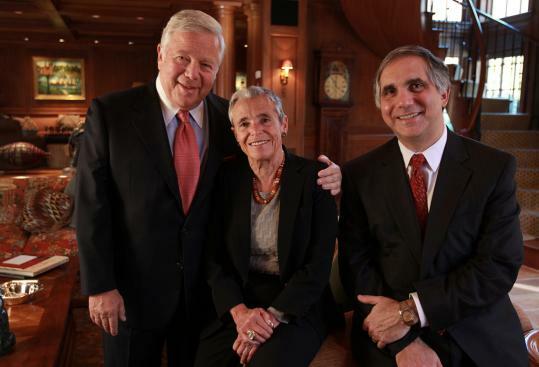 Partners is the parent organization of Massachusetts General and Brigham and Women’s hospitals, and the Krafts have deep professional and personal connections to Harvard’s largest teaching hospitals. Robert Kraft’s longtime primary care physician is Dr. Marshall Wolf at the Brigham, one of the most esteemed internists in the country, and in 2002 he had heart bypass surgery at the hospital. He is on the board of Dana-Farber, which has a shared cancer program with Partners, and his family started the Robert K. Kraft Family Blood Donor Center there. Myra Kraft is on the Brigham board. Their son Jonathan Kraft is on the Mass. General board, and doctors from that hospital have treated the Patriots since 1994. And Partners doctors work at an outpatient center at Kraft’s Patriot Place in Foxborough. Much of the Krafts’ gift is directed toward increasing the number of primary care doctors — usually internists, family practitioners, or pediatricians — who are often the first stop for patients with undiagnosed problems. They provide continuing care for a wide range of conditions and illnesses, as well as routine exams and tests to prevent disease. The Obama administration is counting on these doctors to treat more than 30 million patients expected to get insurance under the national health law, and to play a bigger role in coordinating their care and helping control soaring health care costs. But many medical school graduates are deterred by the grueling hours — doctors often have to be available nights and weekends — and relatively modest pay. The average hourly wage for an internist is about $58, compared with about $112 for an allergist/immunologist or $108 for an orthopedic surgeon, according to data gathered by researchers at the University of California Davis. Primary care hasn’t been “the glory kind of profession,’’ said Dr. Jeff Collins, 49, an internist and pediatrician at the Chelsea Health Center, which is owned by Mass. General. And working in a community health center with low-income patients and those who don’t speak English can be particularly off-putting for some doctors. “Decision making is very team oriented. If you’re one of those doctors who wants to be the be-all and end-all and make the final decision, it doesn’t work that way’’ here, he said. As a result of all these factors, it’s hard to recruit doctors and the center has many vacancies. Collins, who is medical director of urgent care, said while doctors see all patients who come in for urgent treatment, they cannot provide new patients with permanent doctors because most practices at the center are full. “We call around to other practices. Sometimes we find a doctor for them, and sometimes we don’t,’’ he said. Still, health care leaders say the situation overall is improving, at least in Massachusetts. Community health centers have expanded with increased government dollars, an anonymous donor in October gave Harvard Medical School $30 million to create a major center aimed at transforming primary care, and a previous loan repayment program funded largely by Bank of America and launched in 2007 has drawn dozens of doctors into health centers. Leaders applauded the Krafts’ gift as a major step forward. Fellows will receive two years of training in community medicine and will earn a master’s degree from the Harvard School of Public Health or another Harvard school. The program will pay for their tuition and provide up to $50,000 in loan repayment, in return for three years working in a community health center or another program for the underserved. It does not have to be a health center owned by Partners. Physicians, nurse practitioners, nurse midwives, and psychiatric nurses who are already practicing and commit to two years in a health center will be eligible for up to $50,000 in loan repayment and participate in a special mentorship and education program. A National Advisory Council will develop new models for partnerships between teaching hospitals and health centers and build public-private partnerships nationally.